Among others we recommend a collection of texts related to archive theory (Pierre Nora Między pamięcią i historią Les lieux de Memoire: Between Memory and History, Arletta Farge Gesty gromadzenia: Collecting Gestures, Carolyn Steedman Przestrzeń pamięci: w archiwum: Memory Space: in an archive , Pierre Fedida Relikwia i praca żałoby: Relics and Mourning , Michel de Certeau Pisanie historii. Ustanawianie i redystrybucja przestrzeni: Writing History. 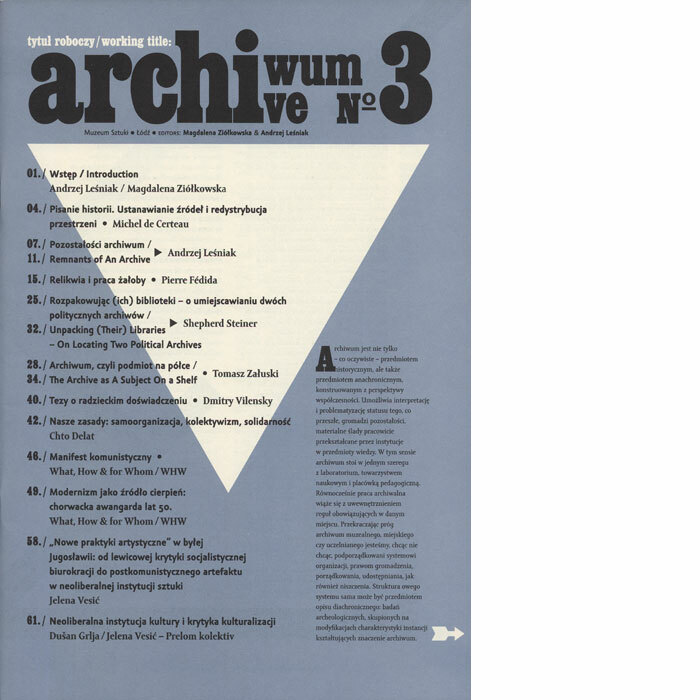 Establishing and Redistributing Space), interviews with artists (Deimantas Narkevicius, Lutz Dammbeck, Anri Sala, Marysia Lewandowska) and critical texts (Igor Zabel, Edit Andras, Kristine Stiles, Chto Delat, Prelom kolektiv, WHW).